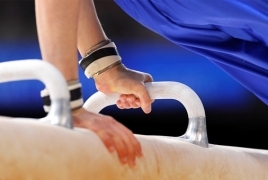 PanARMENIAN.Net - Armenian athletes have won two medals at the FIG Gymnastics World Cup, currently underway in Doha, Qatar. Artur Tovmasyan took silver in the rings event of the tournament, while Vahagn Davtyan snatched a bronze medal. China’s Xingyu Lan, meanwhile, took home the gold medal. Harutyun Merdinyan, meanwhile, came in the fifth in the pommel horse event, while Artur Davtyan will debut in the men’s vault on Saturday, March 23.